Many medical conditions and injuries can cause limited hand dexterity. 180 Medical strives to make it easy for everyone to find a urinary catheter to fit each patient’s lifestyle, including those with limited hand dexterity. Our Catheter Specialists are well-trained in the best products, and what your insurance will and will not cover. My name is Bill, and I am a C-5/6-quadriplegic. I have been living with my spinal cord injury for around 25 years, so today, I’d like to share a few of my personal tips and tricks for cathing with limited hand dexterity. One of the first things to consider when catheterizing with limited hand dexterity is how to access your urethra. There are many products available on the market to assist quadriplegics and those with limited hand dexterity with the self-cathing process. Hands-free cathing mirrors, knee spreaders, and even the MTG Eagle Board are all great options, however, I’ve found that the most effective solution is something that’s probably already in your home. I use a manual wheelchair, and have found that the best way to hold my pants and underwear open is to use a plastic hanger or a bungee cord. You can take the hook of the plastic hanger, hook your pants and underwear on it, stretching the triangle part of the hanger around one of your knees. But, be careful not to break it. This should give you adequate access and provide a hands-free cathing experience. You can also use a bungee cord by putting the hooks on your pants and underwear and then stretching the cord around one of your knees. Some companies offer special hooks shaped like a C that are designed to wrap around your pants and then around the front of your wheelchair seat. Grasping the catheter can be quite difficult with limited hand dexterity, depending on your condition. Personally, my hands do not work at all. I have found the best way to get a good grip on the catheter is to use my forefinger from one hand, and my thumb on the other hand to grasp the catheter. I am able to get a very good hold on it by doing this. 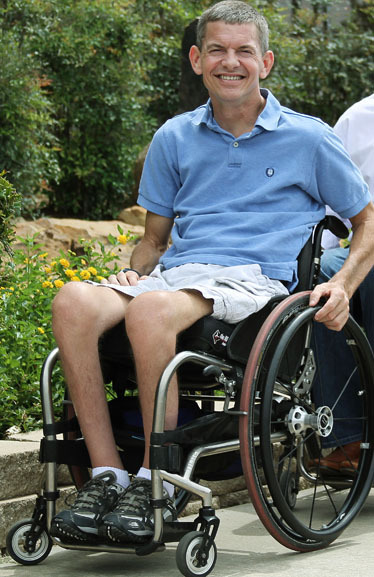 If you’re a quadriplegic and new to cathing, don’t let yourself get discouraged too soon. It may take some time to get your process figured out. When I first started trying it took me up to 30 minutes to cath, I am now able to complete the process in about 10 minutes. There are many resources online to help guide you through the cathing process, including our very own How To Catheterize guide. Our top priority at 180 Medical is to provide the best support for our customers as we possibly can, so don’t hesitate to contact us at any time and we’ll walk you through the process. If you’re in a wheelchair or have any difficulties getting dressed in clothes due to your physical disabilities, this blog can shed some light on adaptive clothing that could make your days easier. Are you new to life in a wheelchair? If you experience frequent UTIs or are just looking for an easier way to self-catheterize, check out our latest blog about closed system catheters.